The idea for Breck’s Gifts was born out of the rich heritage of Breck’s Bulbs. Offering the finest merchandise available at affordable prices has been a Breck’s tradition for nearly 200 years, and it was upon this core concept that Breck’s Gifts was created. Ordering from Breck’s Gifts gives you access to some of the world’s best and most unique items available… at prices that fit every budget. It is our mission, here at Breck’s Gifts, to offer exclusive items that are inspired by the world around us. And it is with this in mind that we spend all year searching out the perfect selection of live plants, seasonal décor, handmade soaps and much more. We choose only the finest quality plants and bulbs for our live, blooming gifts, and present them in charming containers specifically chosen with gift giving in mind. Our Amaryllis gifts are wonderful examples of this dedication to excellence. We pay attention to every detail — so you can present your friends and family with exceptional gifts they’ll treasure for years to come. It is our distinct pleasure to provide a wealth of gift-giving ideas that are not only unique, but also thoughtful and generous in spirit. Our joy is when we are able to please not only our customers, but the gift recipients, as well. 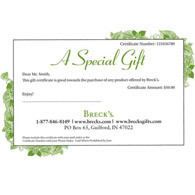 Thank you for visiting Breck’s Gifts. It is our sincere hope that you stay to shop. You’re sure to find something special for each person on your list…and maybe even something for yourself.